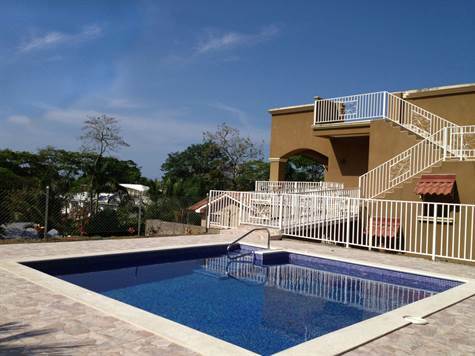 Ideal location on a hillside side with ocean breezes, ocean views and just steps to the beach. Property consists of 2 floors of luxury living. Total of 6 bedrooms plus beautiful new swimming pool on 2 separate lots. Plenty of room to expand as the adjacent lot is included in the selling price plus constructed so that a 3rd floor can be added. Rooftop is currently being used as a 2000 sq. foot observation deck and party area but more rental units or owners penthouse could be added. 1st and 2nd levels consists of 2 separate 3 bedroom rental units, each with lock off quest suite. Property can be rented as two 3 bedroom apartments or as two -2 bedroom apartments with 2 separate quest suites. Top quality construction. Beautiful kitchens with granite countertops, quality appliances, beautiful tile floors, custom windows. Walk to the beach, restaurants and nightlife. Only 5 minutes to jaco. Property is being sold completely furnished and turn key.